Goodreads Synopsis: The massive labyrinth was built to protect Zadie Kalver’s isolated desert town. Unfortunately, living in the maze’s shadow makes her feel anything but safe. Even without its enchanted deathtraps and illusions, a mysterious killer named Dex lurks in its corridors, terrorizing anyone in his path. 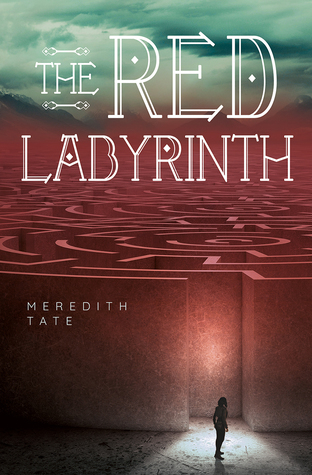 But when Zadie’s best friend vanishes into the labyrinth-and everyone mysteriously forgets he exists- completing the maze becomes her only hope of saving him. In desperation, Zadie bribes the only person who knows the safe path through-Dex-into forming a tenuous alliance. Navigating a deadly garden, a lethal blood-filled hourglass, and other traps-with an untrustworthy murderer for her guide-Zadie’s one wrong step from certain death. But with time running out before her friend (and secret crush) is lost forever, Zadie must reach the exit and find him. If Dex and the labyrinth don’t kill her first. General World: It was a cool idea that this book is a world where a village is cut off from the rest of the world after the world went to crap and some had powers and some didn’t. Also I haven’t seen a ton of cool maze ideas in YA. Some of the labyrinth: There are a few trials inside the maze that the main character has to go through to try and find out the truth. Granted there’s a few things like a deadly garden and a blood filled hourglass that were interesting to see in a maze. Main Character: I really had a hard time connecting with the protagonist Zadie. She never went through any real growth like I had wondered; she felt more like a one sided character instead. She was also a “damsel in distress” type character, where she was always being saved and I never saw in those moments where she tried to get herself out of a situation. This is something in books that I don’t like. She just let people save her and have no independence during the novel. She also was terrible at listening. She was in a situation where things were deadly and she didn’t really trust who she was with, yet she still kept wandering off and disobeyed the suggestions to keep her safe. Not Enough Building: I never felt like the world was fleshed out enough. What you did get about the background of the world, what the village looked like and their “dystopian” situation never felt really there. Things were explained too simply and then never brought up again. The buildings and clothing were never described. Also how many years had they been there? Was this in the near future or many years after the supposed collapse of the world happened? The Maze trials: The major disappointment for me was how the maze was handled. The trials I mentioned sounded like creative and dark, but each trial was over in less than half a chapter. They were too short to feel any tension or get lost in the dark parts of the book. I wanted so much more than this part of this book. Flat Emotions: The other thing that bummed me out was the lack of emotion in this book. So many of the characters never showed more than one or two different emotions, so I couldn’t connect with them. Characters were either mad, afraid or awkwardly laughing at random times. Villains were also just evil and didn’t have a reason to be evil, so I couldn’t get behind them being bad either. I ended up skim reading large chunks of the book just to see what the ending was. Overall: This was a major bummer for me. The ideas sounded good but I don’t feel like there was any payoff. The maze trials were over too quickly to ever feel like they were scary and had any stakes. Also the emotion was never there so I couldn’t get why the villain was bad or cared for the main character. I think there are much better dystopian novels out there if you are a fan of the genre. If you want to try this, then I would give it a try but see if your library will get a copy when it comes out. Have you read this book? Does it sound interesting to you? What are your thoughts?